The Church of the Brothers of Mercy lies on the southern side of the city’s main square. Its front in the style of Renaissance Revival and the adjoining building were built in 1891. They were planned by Johann August Kirstein, who lived in Pécs when the cathedral was built and was known as the area’s most competent architect. Thus, he received many assignments – mostly by clerical clients. The order of the Brothers of Mercy, who were mostly concerned with nursing, was one of his employers. The settlement of the Brothers of Mercy was made possible by a donation of Johann Georg Krautsack, a tanner and miller. The childless patron gave all of his belongings to the order in the early 19th century on the condition that they build an apothecary and a hospital in Pécs. Johann Georg Krautsack’s humble black marble tomb with German lettering from 1829 can be found on the southern wall of the church. 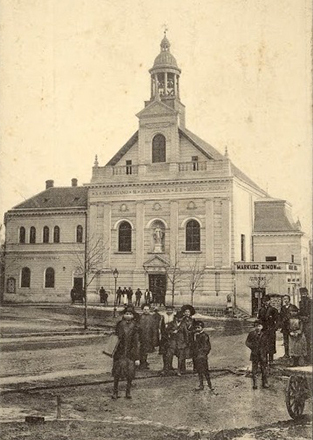 Church of the Brothers of Mercy, 1920s.